‘Una mas cerveza, por favor’ is how to ask for one more beer if the first doesn’t take away the pain of the last 4k. This marathon is a little tricky to gain access to as a foreigner. You really have to do it as part of an organised tour or be part of a club. Not great if you are just a fun runner like me. Race registration was easy enough to negotiate, even to a non-spanish speaker and there is a great little expo of all things running should you want to part with your monopoly money. Sorry, Euros. The race is run in KM so bear that in mind if you’ve been training in miles. Out on the course there was very little signage for the first 5k, which is a fantastic way to throw out your pace! But they did have regular drink station and they even laid on some mist showers to cool you down when the Spanish heat kicked in. It’s a great figure-of-eight course that takes you round all the sights of Madrid, along the wide boulevard style roads and even through the Casa Del Campo urban park. Also look out for huge fountains and the Bernabeu Stadium that you pass in the early stages. Madrid is a much smaller city than it’s reputation but is packed full of character so there’s lots to look at along the course. The last 4K is all up hill so make sure you leave plenty in the tank if you are planning a sprint finish! The race finishes in the stunning Retiro Park which is a great place to kick back after the race. If the last 4k didn’t take your breath away, the park packed with people relaxing and sun bathing, sure will. The support was good but not great when compared to the ‘big’ London and New York marathons of this world. I think this is partly due to the lack of fun runners there. Of the thousands of people I saw on race day, 3 were in fancy dress, including myself! 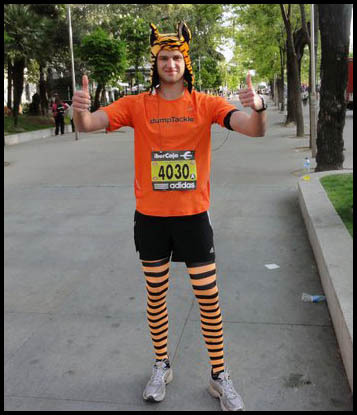 As a fun runner though (dressed as a tiger) the chants from locals of “Vamos Tigre!” was an absolute blessing. I think the Spanish would be up for it, they just need some people to show them the way. Taking into account the poor signage, the last 4K being uphill and the Madrid sun, this makes for one heck of a challenge. There are plenty of hills to break your stride, but the run through Casa Del Campo takes less toll on your joints and is quite literally a walk (well run) in the park. This is what Madrid does well. You finish the grueling last 4k in beautiful sunshine in a park that is blessed with a huge lake and plenty of sunbathers to catch your eye. Chill out here for a wee while before going to grab a cerveza in one of many tapas bars and you will soon find the ache in your limbs giving way to a huge smile on your face. If you have the energy, so does Madrid and it keeps on going until 7am. Truly awesome. It’s well worth staying in the city for a long weekend or longer. Tourist information for Madrid here. I came to Madrid to better my previous Marathon time of 3:58:00 but I wasn’t going to let that get in the way of me having a little fun! Staying with a friend who lives in the city was a great way to get the max out of my stay, but this took a turn for the worse when I found out El Classico (Real Madrid v Barcelona) was being played on pre-race night. KO time? 22h00. Beers consumed? Plenty. In the build up to the race I was the recipient of several odd looks thanks to my tiger fancy dress – which to the Spanish seems the most novel thing to do since someone invented hop-scotch. After the obligatory pre-race-post-beer toilet visit (bring your own paper), I was set to go. When we crossed the start line there was lots of jostling for position, so much so that you forget you are in Madrid and it is easy to miss the huge fountains and the Bernabeu Stadium that you pass in the early stages. A lack of distance markers is a real kick in the teeth when on 6K you realise you are 3 minutes of pace. After settling into my stride I really enjoyed it and my spirits lifted. With about 16miles to go I was on good time, but I managed to spill my energy supply – a pack of gummy bears. This was a real psychological set back it took a lot to gather myself and keep on trucking. So with 3 gummy bears left to get me 10miles I was doubtful of hitting my time. Running in fancy dress is definitely worth it for the added encouragement you get, but I was starting to regret it until I found the misty showers of joy. As expected the last 4k was a real struggle but I reached the top of the meandering hill with gas in the tank, and determined to beat my previous time, I put my foot down fully intending to leave EVERYTHING on the course. As I turned into Retiro Park I heard my name yelled by my mates cheering on the side line. At this point it was all grimace and grunting, sweat and pain. I crossed the line, utterly astonished that I had been able to not only beat my previous time, but to smash a massive 00:23:00 off of it! I crossed the line in a time of 3:35:12 and am not too big of a man to admit that I burst into tears. Awesome experience – thank you, Madrid, for one of the proudest achievements of my life.